My colleague Martin Rowe is continuing his LED makeover at home, and this time he's coming to the All LED Lighting community for advice. We met Martin last September in the context of a project to replace all his kitchen lighting with LEDs in Kitchen's So Bright I Gotta Wear Shades. Now he has this dining-room chandelier to upgrade, and isn't having much luck finding LED replacements. 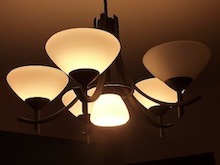 You can see one (incandescent) bulb out in this fixture. 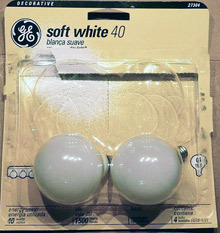 The legacy bulbs are decorative GE globe lamps, as shown at left: 40W input, probably around 450 lumens out, probably right around 2700K CCT. The existing bulbs have an E12 candelabra base, smaller than the much more common E26. That's one of the problems in finding LED equivalents: the smaller market size for the E12 means that fewer manufacturers make them. I saw an LED version of the bulb in a hardware store last week but it had two issues. 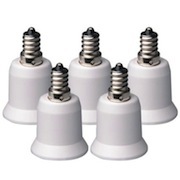 First, it was a 25-W equivalent, not 40-W. Second, it looked as though the light was somewhat directional and for the five up-facing sockets, which would throw less light downward than an incandescent, making the room darker. An alternative that expands the choices would be to use an E12-to-E26 adapter, such as this one in the handy five-pack from Amazon. The only trouble is that it adds perhaps three inches to the bulb's height. Would that be enough to poke the top of the bulb into visibility above the lamp shade, from the perspective of someone standing in the room below? Perhaps. But if we can use the adapter, the options widen. For example, here's a 450-lm, 2700K globe bulb from E2 Lighting that might work nicely. It has less of a "sno-cone" design than the Feit bulb and should project more light downwards. Another E26-base option would be to go with a fluorescent solution like this even brighter GE 800-lumen CFL lamp. At 15 Watts it uses only twice as much energy as a 450-lumen LED bulb, still a big saving over even a 40-W incandescent; and it costs only $6.24. The CCT is not given. Amazon says it provides "comfortable, inviting light." Thanks for clearing that right up. Do you have any other suggestions for Martin?